UPDATE: Next up will be the same benchmarks using Java 6 on ubuntu. Just before JRuby 1.1.1 was released, I was surfing around and found this post which shows JRuby running basic Rails bench tests slower than MRI. I wondered what those numbers would look like now, so I got to testing. I started by downloading the latest binary release of JRuby here. So what does this tell me? 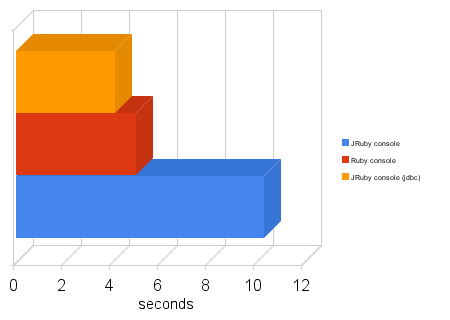 JRuby is getting faster each release. There is more work to be done to make JRuby on Rails apps faster. GlassFish is a very easy way to deploy JRoR apps. And last, I am definitely doing something wrong with my war'd depoyment! I could not find much else in the way of JRuby on Rails benchmarks... if you know of any, please link in comments! All these benchmarks were run on a MacBook 2GHz Core Duo with 1GB mem., Java 5, JRuby 1.1.1, Ruby 1.8.6, Ruby on Rails 2.0.2, MySQL 5.0.27. I always read Charles Nutter recommending Java 6 for running jruby. It's supposedly much faster with jruby. Maybe nice to add to the tests? 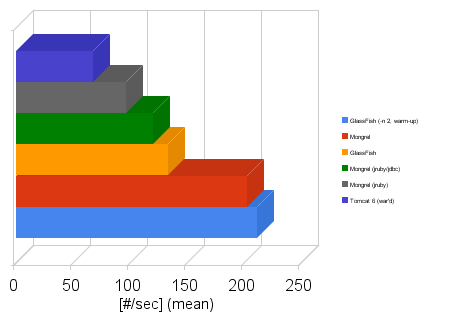 I heared JRuby is quite faster on JVM 6. Very nice graphs. I've learned from this post that really BIG blocks provide better visual cues. And the numbers look pretty good. I can't wait to see your Java 6 numbers. Of course there's always more work to do; we should be faster than this. JRuby 1.1.1 to be released today!